This document is a technical summary of the Federal Highway Administration report Safety Evaluation of Edge Line Rumble Stripes (ELRSs) on Rural, Two-Lane Horizontal Curves (FHWA-HRT-17-069). The Federal Highway Administration (FHWA) established the Development of Crash Modification Factors (DCMF) program in 2012 to address highway safety research needs for evaluating new and innovative safety strategies (improvements) by developing reliable quantitative estimates of their effectiveness in reducing crashes. The goal of the DCMF program is to save lives by identifying new safety strategies that effectively reduce crashes and promote those strategies for nationwide implementation by providing measures of their safety effectiveness and benefit–cost (B/C) ratios through research. State transportation departments and other transportation agencies need to have objective measures for safety effectiveness and B/C ratios before investing in new strategies for statewide safety improvements. Forty State transportation departments provide technical feedback on safety improvements to the DCMF program and implement new safety improvements to facilitate evaluations. These States are members of the Evaluation of Low-Cost Safety Improvements Pooled Fund Study, which functions under the DCMF program. This study evaluated the application of edge line rumble stripes (ELRSs) on rural, two-lane horizontal curves. This strategy was intended to reduce the frequency of run-off-road (ROR) crashes and nighttime crashes by alerting drivers that they are about to leave the traveled lane and by enhancing visibility of the edge line during nighttime and wet-weather conditions. Several research studies have examined the use of shoulder rumble strips (SRSs); however, research into the performance of ELRSs is rare and has not been rigorously evaluated. Additionally, milled rumble strips are installed on roadway segments, consisting of both horizontal tangents and horizontal curves. Installations on only horizontal curves are uncommon and, therefore, safety effectiveness evaluations have not focused on their effectiveness on horizontal curves specifically. This research focused on the safety effectiveness of ELRSs on rural, two-lane horizontal curves, taken from rumble stripe installations that are not specific to horizontal curves. SRSs are provided on the shoulder between the pavement marking and the outside edge of the pavement and can be defined by their offset from the edge line pavement marking. ELRSs are installed where the edge line pavement marking would normally be placed, and the pavement marking is installed directly over the rumble strip. In this way, the rumble stripes are installed closer to the travel lane than common SRSs. 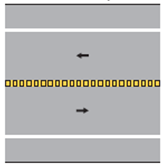 Additionally, vertical faces are created within the milled rumble strip to which pavement markings are applied, thereby enhancing the visibility of the edge line during nighttime and wet-weather conditions. The Manual on Uniform Traffic Control Devices (MUTCD) defines rumble strips as either slightly raised or depressed road surfaces with a rough texture designed to provide a haptic alert for inattentive drivers leaving the travel lane. 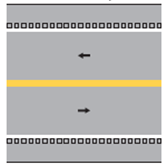 (1) As shown in figure 1, rumble strips may be installed either on the shoulders or center line on rural, two-lane highways, and the edge line may be adjacent to the rumble strip or overlapping with it, creating a rumble stripe. A. Edge line not on rumble strip. B. Edge line on rumble strip. C. Center line on rumble strip. 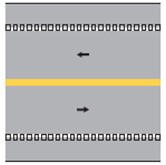 Note: Arrows indicate the direction of travel; hollow squares indicate rumble strip; edge line may be located alongside the rumble strip (A) or on the rumble strip (B); the center line markings may also be located on a center line rumble strip (C). The literature review revealed that SRSs have been studied extensively on all facility types, including rural, two-lane highways. However, few research studies considered the safety effectiveness of ELRSs, particularly the effectiveness on horizontal curves. Torbic et al., in the National Cooperative Highway Research Program (NCHRP) Report 641, evaluated the impact of SRS placement on safety, focusing on single-vehicle ROR (SVROR) fatal and injury crashes. (2) The report defined placement as edge line and non-edge line, which it then compared to no rumble strips. The report defined ELRSs as rumble strips with an offset distance of 0 to 8 inches and non-ELRSs as having an offset of 9 inches or more. For two-lane rural roadways, there was no significant or practical difference between ELRSs and non-ELRSs. ELRSs were associated with a 33-percent reduction in SVROR fatal and injury crashes. Also, there is no evidence that suggests SRSs result in a reduction of SVROR crashes involving heavy vehicles. Other researchers examined operational and visibility impacts of ELRSs. The University Transportation Center for Alabama compared ELRSs to flat thermoplastic edge markings and found that the initial dry retroreflectivity was similar; however, ELRSs lost visibility at a lower rate due to cumulative traffic passes. (3) ELRS wet retroreflectivity was higher than flat thermoplastic markings, but degradation could not be compared. The Mississippi Department of Transportation (MDOT) installed ELRSs on a portion of Interstate 59 with generally encouraging results. (4) Preliminary data indicated that the strategy provided an excellent audible alert, increased visual awareness of the travel lane, increased reflectivity, and provided similar results as inverted profile striping, and Mississippi residents welcomed the installation. However, there were also concerns associated with the rumble stripes, including noise pollution and the potential for an increase in overcorrecting and head-on crashes. Carlson et al. examined wet-night visibility of pavement markings using experimental drivers on a closed rain tunnel. (5,6) The study tested nine different treatments in random orders and measured perception distance for each sample location. The driver alerted the researcher when he or she observed a marking and when the type could be determined. Part of this research included the testing of rumble stripes. The findings suggest there is little difference between flat thermoplastic lines and rumble stripe lines at low rainfall rates. However, the detection distance was 13 to 38 percent greater for rumble stripe lines for medium and heavy rainfall rates. Total (all types and severities combined). Fatal and injury (K, A, B, and C injuries on KABCO scale) (K is fatal injury, A is incapacitating injury, B is non-incapacitating injury, C is possible injury, and O is property damage only). Nighttime (including dusk and dawn; all severities combined). Nighttime ROR (including dusk and dawn; all severities combined). A further objective was to conduct a disaggregate analysis to investigate whether the safety effects vary by factors such as the level of traffic volumes, the frequency of crashes before treatment, posted speed limit, and shoulder width. The evaluation of overall effectiveness included the consideration of the installation costs and crash savings in terms of the B/C ratio. The project team estimated the SPFs used in the EB methodology through generalized linear modeling assuming a negative binomial error distribution, which is consistent with the state of research in developing these models. In specifying a negative binomial error structure, the project team estimated an overdispersion parameter, which they used in the EB calculations, iteratively from the model and the data. For a given dataset, smaller values of this parameter indicate relatively better models. Due to differences in application in Kentucky and Ohio, the results are presented separately. The Kentucky results represent the safety effectiveness of only ELRS application, while the Ohio results include the effects of a simultaneous statewide sign upgrade program. In this program, many curves received new or upgraded advance warning signs, in-curve warning signs, and updates to advisory speeds. The results are presented in two parts. The first part contains aggregate results, and the second part is based on a disaggregate analysis that attempted to discern factors that may be most favorable to the installation of ELRSs on rural, two-lane horizontal curves. The second part focuses on Ohio data, since the sample sizes are too small in Kentucky for further disaggregate analysis. Table 1 provides the estimates of expected crashes in the after period without treatment, the observed crashes in the after period, and the estimated crash modification factor (CMF) and its standard error (SE) for all crash types considered in Kentucky. Table 2 presents the results for Ohio. Table 1. Results for Kentucky. *Indicates statistically significant results at the 95-percent confidence level. Table 2. Results for Ohio. The results for Kentucky indicate statistically significant reductions for all crash types except for nighttime ROR crashes at the 95-percent confidence level. Nighttime crashes have the smallest CMF (which translates to the greatest reduction) with a CMF of 0.63. Total, fatal and injury, and ROR crashes have CMFs of 0.75, 0.64, and 0.74, respectively. The CMF for nighttime ROR crashes is consistent with other crash types; however, the sample size is very small. The CMFs are smaller than, but consistent with, those found in the most comprehensive and reliable study of SRSs to date, NCHRP Report 641. (2) Based on a before–after EB analysis, the project team found that milled SRSs have a crash reduction of 16 percent (SE = 8) for all SVROR crashes and 36 percent (SE = 10) for SVROR fatal and injury crashes. (2) However, the analysis results for SRSs in NCHRP Report 641 considered segments with both horizontal tangents and curves; therefore, a direct comparison of results cannot be made. It is also important to remember that all crash types considered in this research exclude intersection-related and animal crashes. The results for Ohio indicate statistically significant reductions for all crash types. Nighttime ROR crashes have the smallest CMF with a CMF of 0.71. Total, fatal and injury, ROR, and nighttime crashes have CMFs of 0.79, 0.79, 0.78, and 0.75, respectively. As with the Kentucky results, the CMFs are consistent with those found in NCHRP Report 641. (2) The resulting Ohio installation CMFs reflect the installation of ELRSs on horizontal curves as well as the impact of the statewide signing program. Due to the spillover effects of the signing program, further analyses involving curves that specifically received new or additional signs were not fruitful. The results indicated that there is little to no additional benefit for the combination of ELRSs and horizontal curve signing in comparison to horizontal curve signing only. The disaggregate analysis sought to identify those conditions under which the treatment is most effective. Since ROR, nighttime, and nighttime ROR crashes are the focus of this treatment, these crash types are the focus of the disaggregate analysis. Additionally, disaggregate results are presented for total crashes and fatal and injury crashes. The data sample for Kentucky is too small to perform disaggregate analyses; therefore, disaggregate analyses focus on Ohio data. The project team identified several variables as being of interest and available, including degree of curve, posted speed limit, paved shoulder width, lane width, annual average daily traffic (AADT), and before-period expected crash frequency. Disaggregate results are provided by AADT in table 3 and before-period expected crash frequency in table 4. The number of crashes in the after period is presented for each CMF to indicate the sample size available. Several of the estimated CMFs rely on small samples, especially for nighttime crashes and nighttime ROR crashes. 3. Ohio results by AADT. Table 4. Ohio results by before-period expected crash frequency. The 95-percent confidence intervals did not overlap for total crashes and ROR crashes. Due to the differences in the frequencies of different crash types, the before-period expected crash frequency cutoff varied for each crash type. For example, an ROR CMF of 1.13 was estimated for horizontal curves with an ROR before-period expected crash frequency less than 0.20 crashes per year. This can be compared to a CMF of 0.66 for horizontal curves with 0.20 or more before-period expected crashes. Note that the CMF of 1.13 for an ROR before-period expected crash rate less than 0.20 was not statistically significant. Similar results were found for all other crash types. Caution should be used in interpreting and applying these disaggregate CMF results because of correlation among variables and because they were not robust enough to develop crash modification functions. A crash modification function is a formula used to compute the CMF for a specific site as a function of its site-specific characteristics. For example, crash modification functions would allow the estimation of CMFs for different levels of AADT and before-period crash frequency. Additionally, the disaggregate analysis results used the EB analysis data, which includes the effects of the statewide horizontal curve signing program. However, the disaggregate analysis CMFs may be used in prioritizing treatment sites. For example, sites with a high proportion of ROR crashes and high AADTs will have high priority. The research team conducted an economic analysis to estimate the B/C ratio for this strategy on rural, two-lane horizontal curves. For the purposes of the economic analysis, the assumed treatment is the application of ELRSs. The team used the recommended CMFs of 0.75 for Kentucky and 0.79 for Ohio to estimate the benefit of this treatment strategy. The Ohio results likely include the impact of additional sign upgrades, for which the Ohio Department of Transportation (ODOT) did not have data that could be included in this analysis. Additionally, the project team did not include the cost of pavement markings in the study because they are already present on the roadway, and the ELRSs did not affect the lifespan of edge line pavement markings. Treatment costs range from $1,700 per mile for Ohio and $2,500 per mile for Kentucky. Service life is 12 to 15 years for Kentucky and 7 to 10 years for Ohio (ODOT noted that the service life lasts as long as the pavement). The project team assumed a conservative value of 12 years for Kentucky and 7 years for Ohio. The FHWA Office of Safety R&D suggests that the Office of Management and Budget Circular A-4 be used to determine the conservative real discount rate of 7 percent. (10) The project team applied this discount rate to calculate the annual cost of the treatment for 12-year and 7-year service lives in Kentucky and Ohio, respectively. With this information, the project team computed the capital recovery factor to be 7.94 for a 12-year service life and 5.39 for a 7-year service life. The FHWA’s most recent mean comprehensive crash costs, which are disaggregated by crash severity, location type, and speed limit, are based on 2001 dollar values. (11) The 2001 unit costs for property-damage-only (PDO) and injury crashes from the FHWA report ($7,428 and $158,177) were multiplied by the ratio of the 2014 (when the analysis was performed) value of a statistical life of $9.2 million to the 2001 value of $3.8 million. (12,13) By applying this ratio of 2.42 to the unit costs for PDO and injury crashes and then weighting by the frequencies of these two crash types in the after period, the project team obtained the aggregate 2014 unit costs for total crashes of $128,268 and $166,603 for Kentucky and Ohio, respectively. The project team calculated the total crash reduction by subtracting the actual crashes in the after period from the expected crashes in the after period had the treatment not been implemented. The number of crashes saved per mile-year is 0.812 in Kentucky and 0.913 in Ohio. The project team obtained these numbers by dividing the total crash reduction by the number of after-period mile-years per site. The annual benefit (i.e., crash savings) of $104,165 in Kentucky and $150,368 in Ohio is the product of the crash reduction per mile-year and the aggregate cost of a crash (all severities combined). The B/C ratio is calculated as the ratio of the annual benefit per mile to the annual cost per mile. The project team estimates the B/C ratio to be 331:1 in Kentucky and 477:1 in Ohio. USDOT recommended a sensitivity analysis be conducted by assuming values of a statistical life of 0.57 and 1.41 times the recommended 2014 value. (12) These factors were applied directly to the estimate B/C ratios to obtain a range of 189:1 to 467:1 for Kentucky and 272:1 to 672:1 for Ohio. On first inspection, the B/C ratios are larger than expected for an installation of this type. However, the installations took place on corridors, while the analysis only looked at the safety effects on horizontal curves. Horizontal curves have higher crash rates than overall corridors, and the cost per mile of installation would not be representative for installations only on horizontal curves. As a curve-specific treatment, the B/C ratio would likely be reduced due to the higher deployment cost for spot-specific installations; however, these results suggest that the treatment can be highly cost effective. The objective of this study was to undertake a rigorous before–after evaluation of the safety effectiveness, as measured by crash frequency, of ELRSs applied on rural, two-lane horizontal curves. The CMFs shown in table 5 and table 6 are recommended for the various crash types. The results for Kentucky are based on smaller sample sizes, and the results for Ohio include the effects of a statewide horizontal curve warning sign upgrade program. Table 5. Recommended CMFs for ELRSs based on Kentucky data. Table 6. Recommended CMFs for ELRSs and curve signage based on Ohio data. To date, the most comprehensive and reliable study of SRSs is published in NCHRP Report 641—Guidance for the Design and Application of Shoulder and Centerline Rumble Strips. (2) Compared to the results of that study for ELRSs, the results suggest that placing rumble strips on or near the edge line for horizontal curves, specifically, may result in greater reductions in all crash types. It also appears that ELRSs are associated with significant reductions in nighttime crashes but do not further reduce nighttime ROR crashes on horizontal curves. A disaggregate analysis of the results indicated that, for horizontal curves with AADTs greater than 4,000 for all crash types, there are larger safety benefits; however, the differences by AADT are not statistically significant at the 95-percent confidence level. The disaggregate analysis further indicated larger safety benefits for horizontal curves with a higher before-period expected crash frequency. The results suggested no benefit for curves with low before-period expected crash frequencies for all crash types. The difference in CMFs between low before-period expected crash frequency and high before-period expected crash frequency is statistically significant for total and ROR crashes. The project team estimated the B/C ratios to range from 189:1 to 467:1 for Kentucky and from 272:1 to 672:1 for Ohio. The high B/C ratios should be considered in the context that the installations took place on corridors, while the analysis only looked at the safety effects on horizontal curves. Horizontal curves have higher crash rates than overall corridors, and the cost per mile of installation would not be representative for installations only on horizontal curves. Additionally, the safety effectiveness evaluation in Ohio included the impacts of upgraded horizontal curve warning signage. As a curve-specific treatment, the B/C ratio would likely be reduced due to the higher deployment cost for spot-specific installations; however, these results suggest that the treatment—even its most expensive variation—can be highly cost effective. U.S. Department of Transportation Federal Highway Administration. (2009). Manual on Uniform Traffic Control Devices for Streets and Highways, USDOT Federal Highway Administration, Washington, DC. Torbic, D., Hutton, J., Bokenkroger, C., Bauer, K., Harwood, D., Gilmore, D., Dunn, J., Ronchetto, J., Donnell, E., Sommer H., III, Garvey, P., Persaud, B., and Lyon, C. (2009). Guidance for the Design and Application of Shoulder and Centerline Rumble Strips, Report 641, National Cooperative Highway Research Program, Transportation Research Board of the National Academies, Washington, DC. Lindly, J. and Narci, A. (2006). Evaluation of Rumble Stripe Markings, UTCA Report 04405, University Transportation Center for Alabama, University of Alabama, Tuscaloosa, AL. Willis, J. and Dean, W. (2004). “Mississippi’s Rumble Stripe Experience.” Presented at the 83rd Annual Meeting of the Transportation Research Board, Washington, DC. Carlson, P.J., Miles, J.D., Pratt, M.P., and Pike, A.M. (2005). Evaluation of Wet-Weather Pavement Markings: First Year Report, Report No. FHWA/TX-06/0-5008-1, Texas Department of Transportation, Austin, TX. Carlson, P.J., Miles, J.D., Pike, A.M., and Park, E.S. (2007). Evaluation of Wet-Weather and Contrast Pavement Marking Applications: Final Report, Report No. FHWA/TX-07/0-5008-2, Texas Department of Transportation, Austin, TX. Hauer, E. (1997). Observational Before-After Studies in Road Safety—Estimating the Effect of Highway and Traffic Engineering Measures on Road Safety. Elsevier Science, Incorporated, Amsterdam, Netherlands. Patel, R.B., Council, F.M., and Griffith, M.S. (2007). “Estimating the Safety Benefits of Shoulder Rumble Strips on Two-Lane Rural Highways in Minnesota: An Empirical Bayes Observational Before-After Study.” Presented at the 86th Annual Meeting of the Transportation Research Board, Washington, DC. Lyon, C., Persaud, B., and Eccles, K. (2015). Safety Evaluation of Centerline Plus Shoulder Rumble Strips, Report No. FHWA-HRT-15-048, Federal Highway Administration, Washington, DC. Office of Management and Budget. (2003). Circular A-4: Regulatory Analysis. USDOT, Washington, DC. U.S. Department of Transportation. (2014). Guidance on Treatment of the Economic Value of a Statistical Life (VSL) in U.S. Department of Transportation Analyses—2014 Adjustment, Memorandum, USDOT, Washington, DC. Available online: http://www.dot.gov/sites/dot.gov/files/docs/VSL_Guidance_2014.pdf, last accessed November 12, 2014. Zaloshnja E., Miller, T., Council, F., and Persaud, B. (2006). “Crash Costs in the United States by Crash Geometry. Accident Analysis and Prevention, 38 (4), pp. 644–651, Elsevier Science, Incorporated, Amsterdam, Netherlands. Researchers—Scott Himes, Frank Gross, Bhagwant Persaud, and Kimberly Eccles. Key Words—Rumble strips, rumble stripes, low-cost, safety improvements, safety evaluations, empirical Bayesian.